The Marriage Pact by Michelle Richmond is about a newlywed couple in San Francisco named Jake and Alice who receive an unusual wedding gift from a couple they don’t know well. It turns out to be an invitation to join a very selective club called The Pact, an underground network of couples around the world who are committed to preserving marriage and helping keep their members’ unions happy and healthy. There is a long book explaining the rules of The Pact, but neither Alice (a lawyer) nor Jake (a therapist) read much of it. They pick up some of the basics – always answer the phone when your spouse calls; buy your spouse a thoughtful gift every month; take trips together every quarter – and they seem reasonable. They are happy and in love, and they sign the Pact without giving it much thought. Next comes the first home visit from a Pact member and the first strange dinner gathering they attend with other Pact couples in the Bay Area, and it becomes clear that the Pact is serious – and intrusive. And it’s for life – once you join, you can’t leave. When Alice starts working a lot at work, leaving Jake to dinners and nights on his own, she is punished and required to attend weekly sessions with another Pact member to refocus her attention. And that’s just the beginning. By the end of The Marriage Pact, Alice and Jake have been severely punished – even incarcerated – by The Pact for various transgressions. The intensity of the action ratchets up throughout the book as Jake and Alice alternatively embrace and try to escape The Pact. I liked the concept behind The Marriage Pact. What makes a strong marriage? Does The Pact help marriage though its strict rules and constant surveillance, or does it strain marriage through stress and fear? How far would you be willing to go – and how much would you sacrifice – to ensure the health of your marriage? These are interesting questions and I liked how Richmond explored them in the beginning of the book. But I thought the book kind of went off the rails after that. Too much brute force, too many plot cycles (Jake trusts Alice; he doesn’t; she’s committed; she’s evasive), just too much. In the end, the couple’s punishments were too extreme and their costs too high. Plus it’s a stressful read. I am not that into thrillers and that’s what The Marriage Pact turned out to be. So this was definitely a mixed bag. Great concept, but ultimately just too much for me. Posted on November 27, 2017 by gayle. 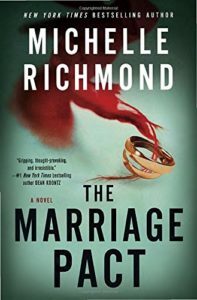 This entry was posted in Fiction and tagged michelle richmond, the marriage pact. Bookmark the permalink.